Scores of people are making their way to the Sharpeville stadium to celebrate Human Rights Day. 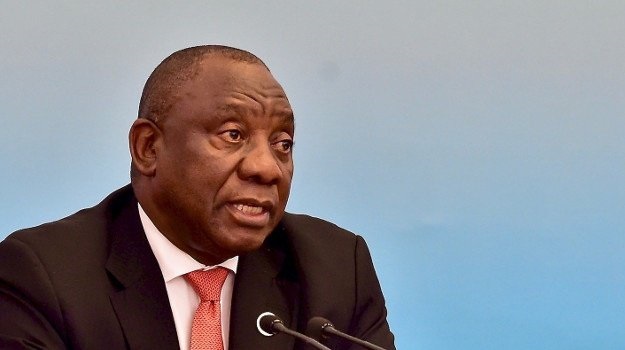 President Cyril Ramaphosa is leading a delegation of government officials that have descended to the Vaal triangle to commemorate the 69 men and women that were killed during a peaceful protest on 1960. Ramaphosa started with a wreath laying ceremony at the victims gravesite earlier on Thursday. Shortly after, Ramaphosa accompanied by Minister of Arts and Culture Nathi Mthethwa and Gauteng Premier David Makhura, is expected to address the community of Sharpeville at the community sports grounds. Over 1 000 people have already arrived at the sports grounds to listen to Ramaphosa. Many observers donned ANC t-shirts plastered with Ramaphosa's face. A jubilant group of youths were dancing and cheering to music from the entertainment lineup. News24 spoke to three women who said they were excited to see Ramaphosa in their community. Khoni Ratau, 68, said she was a young woman when scores of people were mowed down by police in Sharpeville. "I was there. I remember how sad we were when police killers our brothers and sisters. To me this is a sad day. A moment to remember friends I lost and our history. We have come a long way." Ratau was accompanied by her 16-year-old granddaughter Kea who said she has grown up hearing stories of the massacre. "I am happy to be here. It's an important day for this area. I am also grateful that my grandmother teaches me about our history." Kea said she wanted Ramaphosa to give more clarity on free higher education. "What I want from the president is to tell me I can further my studies when I leave school. I am in Grade 10 and I don't want my grandmother to worry about paying for fees. I want to be an engineer and I have faith in the ANC and the president to help me get my education." Another woman, Gracious Witbooi said she was ready to vote for her party, the ANC, come election day on May 8. "He (Ramaphosa) has proven himself to me. He is the man for the job. He must uplift this community. I have faith in the ANC. They are giving us food. I will never vote for any other party," the 47-year-old said. The day is commemorated in remembrance of an anti-pass march at the Sharpeville police station on March 21, 1960. The brutal attack against protesters by police ended with a mass killing of 69 people and more than 100 others wounded. The Human Rights Day celebrations have drawn several political parties to the area. The EFF, is holding its own commemoration event at the Dlomo Dam along Seeiso Street. Scores of ANC and PAC supporters used that very road to get to their own respective different commemoration venues. The Black First Land First (BLF) party pitched a gazebo some 500m from the EFF's event, while busses ferrying ANC supporters pass by. One EFF elderly supporter present at the event, told News24 that the Sharpeville massacre should be "a painful reminder that some people were brutally killed while on a quest for freedom and democracy". The party's Gauteng Chairperson Mandisa Mashigo said that the day was of significant importance to the history of SA, as people had "fought for our ultimate freedom in our country". The party's leader Julius Malema is expected to give the key note address once the programme officially begins.